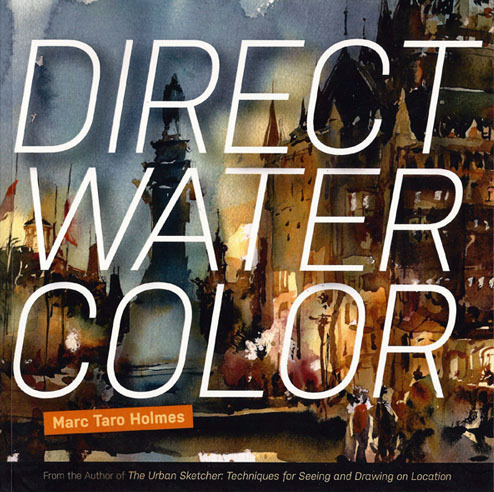 Marc Taro Holmes has released a new book, Direct Watercolor, and I have to confess that I’m a biased reviewer. I love the pedagogic skills and dedication he brings to his art instruction. Yes, his art is fantastic but his first book, The Urban Sketcher and his Craftsy courses are each a tour de force in their subject areas. You can’t just read/watch Marc’s lessons; you’ve got to listen closely, multiple times, or you’ll miss many of the little gems he casually drops in front of you. Maybe more important, Marc seems driven by the notion that he’s not providing enough bang for the buck because he crams more into a book or video than anyone so you do, indeed, get a lot of bang for your buck. Direct Watercolor is a good illustration of that. 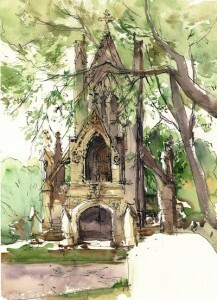 Direct Watercolor is a bit different from his previous offerings as it has multiple goals. 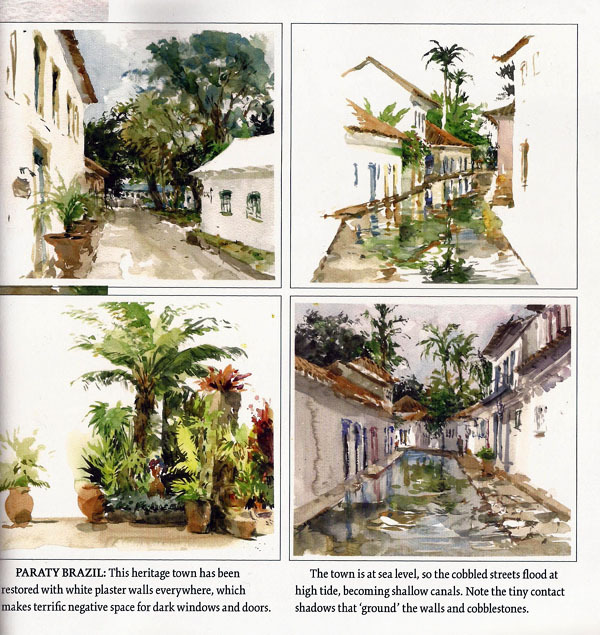 While there is considerable information about how to sketch directly with watercolor, it’s also a presentation of a bunch of his art, done in this way, which serves to enforce the instruction, but also serves as a travel journal of some of the more exotic places Marc has sketched. These goals knit together go together like a good wine and cheese. 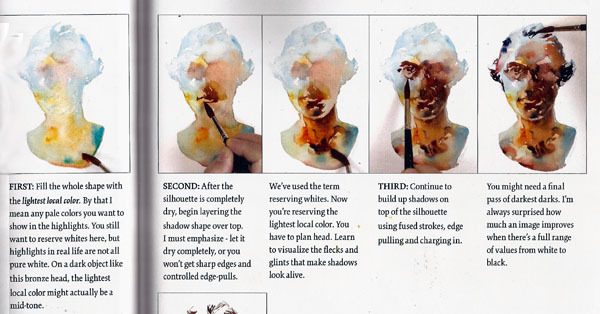 The end result is not only an instruction book, it’s a book stuffed full of eye candy. The back cover says there are over “80 plein air watercolor paintings.” When I counted them I got more than 100, along with the half a dozen step-by-step demonstrations and pages showing the basic techniques. Only Marc can get all this into a 100 page book. Truth is, this book is so full of beautiful art that it’s worth owning whether you do any watercolor work or not. I do question one thing, though, and that’s the title, Direct Watercolor. Anyone who is a sketcher would mentally put “rather than ink and wash” after that title, but I wonder how it would be interpreted by a watercolorist who isn’t a sketcher. Is there another kind of watercolor other than putting the pigment directly on the paper? Maybe a subtitle would have been appropriate. In any case, we sketchers know what he’s talking about and that’s all that matters (grin). From the title of this post you might be wondering if I’ve gone mad. 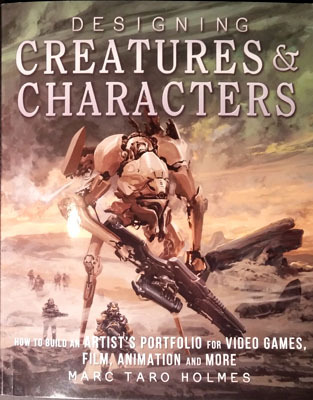 You might be asking “What does Designing Creatures & Characters have to do with being a street sketcher in Quebec City?” Truth is, I bought this book because of the words at the bottom of the cover, Marc Taro Holmes. I’m a big fan. I love his art and because he’s so giving of his time and expertise online, if he’d illustrate the Quebec phone book I’d buy one, and I never call anyone any more. 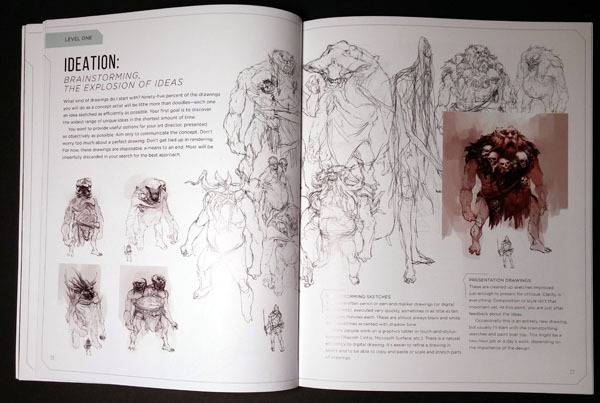 This book is about how to become a concept artist, working in an animation studio. I know nothing of that world and I figured I’d get this book, flip through it, enjoy the pictures and put it on a shelf. But I found myself reading it, cover-to-cover, gleaning little bits and bobs while learning how character development works in the minds of people with imagination. Wish I had some (grin). What I have to confess is that I’m not in a position to review this book. It’s beautiful but beyond that, I’m out of my depth. 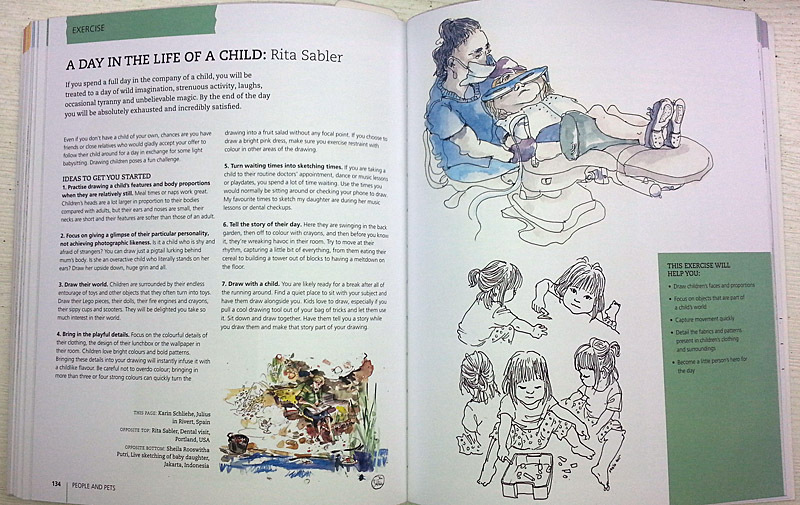 The book is divided into four sections: Ideation, Anatomy, Animation, and Illustration. Each section presents information about its subject and then there are nine projects for the reader to accomplish. It might be to develop a set of fishes inhabiting the sea in a video fishing game or development of a group of possibilities for a warlord character. One project is the development of a crew of a pirate ship. Each of the major sections builds on its predecessors and eventually you are at a point where you have fully-rendered characters, drawings showing detailed construction information, and drawings showing how the character moves and any special features of said character. It’s all pretty cool. To be honest, I got the most from the Ideation section. This section is closest to what I do. It’s sketching and in this case, it’s sketching in the form of brainstorming ideas, dumping as many as you can on the page so they can be visualized and evaluated. This was where I surprised myself because I found myself scribbling copies of some of those sketches and I had a ball doing them. I even started adding stuff to those sketches, or removing things. To be sure, I would have been laughed out of any concept director’s office but it was fun nevertheless. I’m not a fan of digital rendering as it all looks the same to me so when the book ventured further into a concept artist’s process, the book sort of lost me. 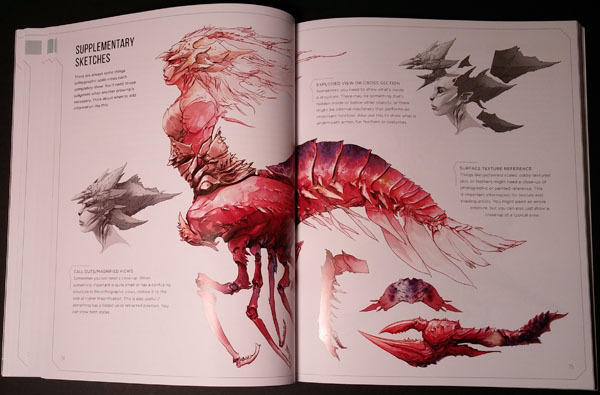 All I could do was look at the pictures because I have no idea how to digitally render a cube, let alone complex creatures. I wish I could say more about this book but, quoting Clint Eastwood, “A man’s gotta know his limitations.” What I can say is that IT’S A MARC TARO HOLMES BOOK and I love it. One of the first urban sketchers I started trying to mimic was Pete Scully. When I was getting started in sketching he was creating small building portraits (often two to a page in Moleskine watercolor sketchbooks). 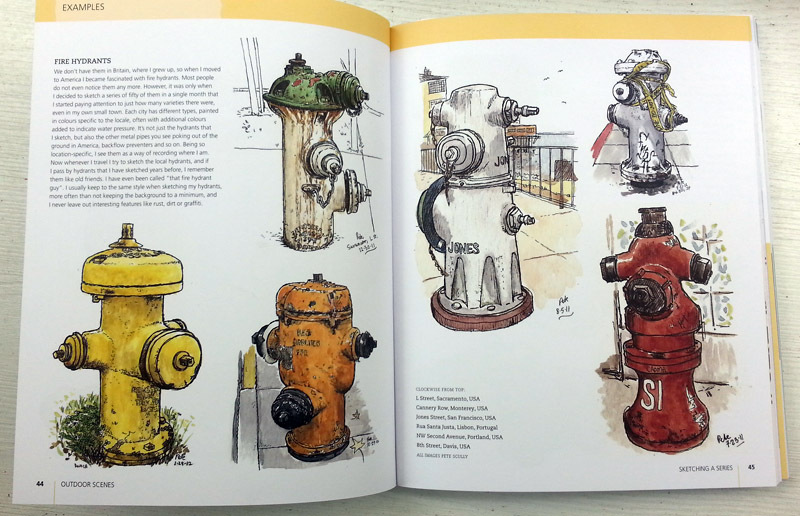 He also got me hooked on drawing fire hydrants and I continue to learn from his sketches. 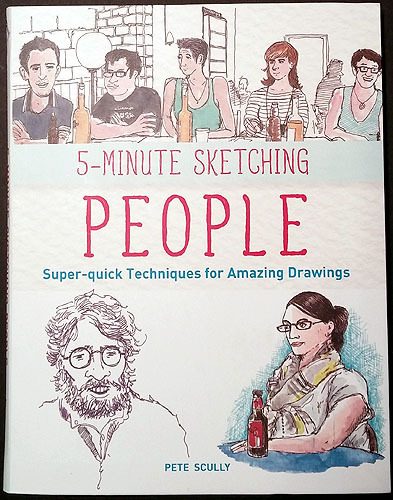 Today, though, I want to talk about Pete’s new book, 5-Minute Sketching: People. It’s part of what may become a series from Firefly books. When I reviewed Liz Steel’s book in this series I made some comments about how structured, and to my mind limiting, the publisher-dictated format was and if you haven’t read that review I encourage you to do do so here. While some of those limitations do affect discussion of sketching people, I think it’s less limiting than for sketching buildings for a couple reasons. I think, far more real-time people sketching is done in less than 5-minutes than is building sketching and, for so many people, quick-sketching is so foreign that there are a lot of useful tips one can provide that are quite separate from the actual drawing itself. Pete does a great job of talking about how to capture people quickly, how to put yourself in good positions to do so, and how to make those captures interesting. Section one is titled How To See, and Pete starts out with some basic dimensional anatomy of the human form. There are sections on arms and legs, faces, and all the things you’d expect to find in a ‘how to see humans’ section. 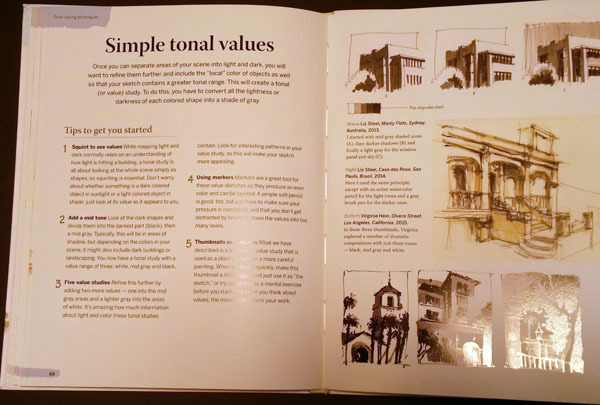 This expands into sections regarding quick composition and simple backgrounds, to bring your sketches to life. He talks about playing with perspective and using negative space to position people in a scene as you draw and each of these sections is a series of hints and tips to related to each topic. Section two is titled Quick On The Draw and here Pete emphasizes the need for speed. His discussions run the gamet from drawing quick portraits to some great tips for drawing a crowd of people quickly. There’s an interesting section on capturing conversation in sketch form and another on how to capture passers-by using compositing ideas and building up your visual memory capabilities. This section, and the next, form the meat and potatoes of the book with a bundle of great ideas, some of which I’ve done, some not… yet. 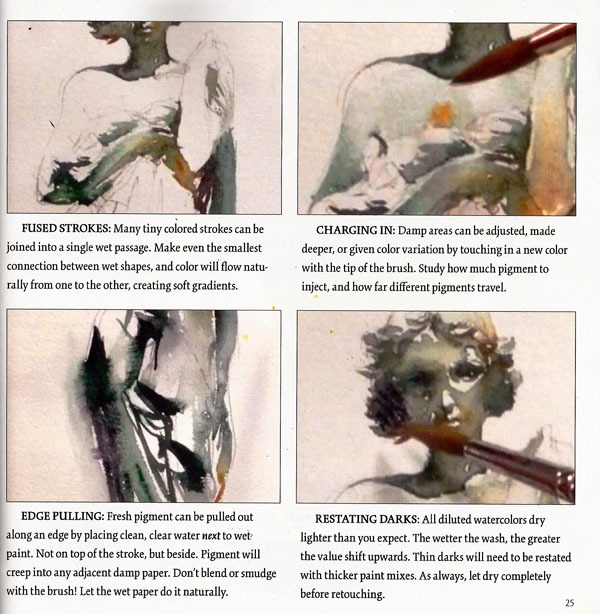 Section three of the 5-Minute Sketching series is titled Time-Saving Techniques and here Pete emphasizes the use of different line techniques; how to do simple tonal sketching; how to sketch over color and other approaches that help to provide quicker, but more satisfying sketches. Section four is titled Speedy Supplies and Pete provides series of tips to help when using pencil, pen and ink, markers, pastels, etc. as well as providing some advice on things like paper choice and even a bit on using digital media. I confess that I didn’t get much from this section but I’m fairly myopic in my choice of medium so that’s probably the reason. While this book won’t teach you how to draw, it should be very helpful for those wanting to get out and draw people on location. If you’ve never done it, it’s a daunting task but Pete’s tips should put your mind at ease and provide a gentle nudge to get you out the door. This will be a very biased review. I have followed Liz Steel’s blog and Facebook posts for several years. She’s been one of the most giving artists within our sketching world. She’s also one of the best. I’ve taken all three of Liz’s online classes and have found them truly amazing because Liz “gets it” when it comes to teaching art. She’s one of my sketching heros. 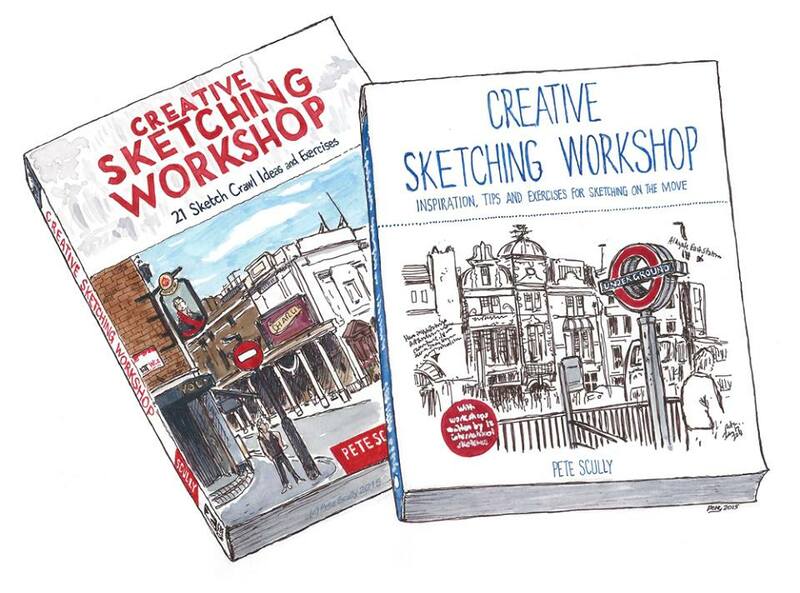 Firefly Books has just launched a new “5-Minute Sketching” series of books and Liz Steel and Pete Scully have had their books in that series launched simultaneously. They’re both winners in my book and I’ll be reviewing Pete’s book at a later date. I do want to say a couple things about the series. The content of these books is tightly organized by the publisher. Each has four chapters with identical titles, and many of the sub-section titles are identical as well, particularly in chapters three and four. It’s interesting to see how Liz and Pete have packed a wealth of knowledge into this somewhat restrictive construct, adjusting it to fit their particularly topic. I do a lot of quick-sketching but I have to say that I feel that the notion that you can write books about “5-minute sketching” without filling them with yet another discussion of gesture drawing smacks of naivete on the part of the publisher. Even Liz, who is a very fast architectural sketcher, will spend far more than five minutes sketching any building more complex than a simple box. Lucky for us, Liz acknowledges this in her introduction and then proceeds to provide her information as though we’re trying to work quickly, but not unreasonably so. Lastly, I confess that I’m an academic. It grates on me that brilliant artists are supposed to boil down teaching art into “tips” rather than complete discussions of the subject. For those new to the subject it’s clearly the case that many tips will generate “How do I do that?” responses from those trying to learn to draw. Of course, the flip-side of this is that these kinds of books are starting to fill the needs of people who have moved beyond basic drawing skills and who want books about how to approach subjects, how to use basic skills to solve problems, etc. Liz’s book does exactly that. She is not teaching you how to draw buildings. She’s teaching how to sketch buildings quickly and well. 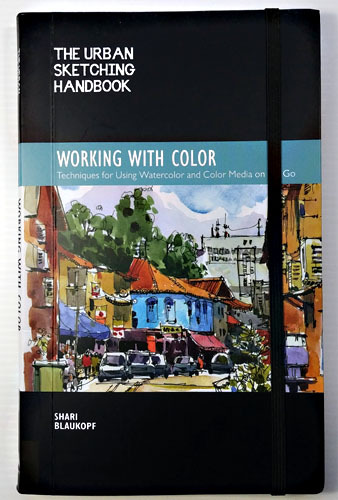 She has managed to pack so much information into this book that it takes considerable effort to read and think about what is written and how it might apply to your own sketching. This is a book you’ll want to read more than once. It’s a book you’ll want to study and apply to your art. 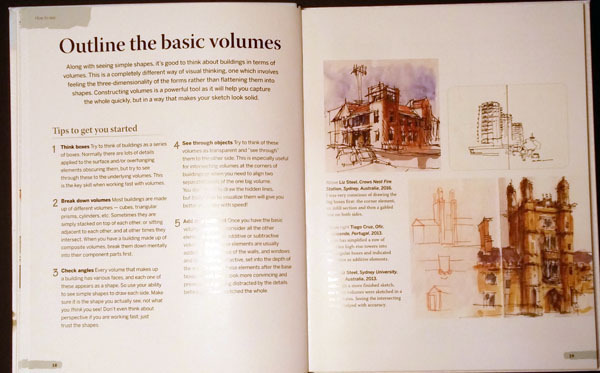 The first chapter emphasizes how to “see” the buildings you want to draw. Liz places emphasis on seeing the volumes of the buildings, how to lay out basic structure so that the actual drawing can go much more quickly and freely. She discusses using the advantages of actually having the building in front of you to simplify your approach to perspective in what she refers to as “pointless perspective.” There’s also an interesting set of tips on using distortion to add some playfulness to your drawings. Chapter two jumps into the actual drawing of buildings, providing insights into how to identify and simplify various aspects of buildings. She covers everything from simple houses to large historic buildings. She provides a bunch of great tips for drawing interiors, complete streetscapes, bridges and even construction sites. As mentioned above, she’s not showing you how to draw these in five minutes but her ideas will help you improve both your sketches and the speed at which you can accomplish them. Chapter three is a fun one for me. It’s titled Time-Saving Techniques and Liz talks about approaches that allow you to capture volumes quickly, like using a minimum of lines, rapidly creating volumes with restated lines, working smaller and working with tonal values to capture volumes. There’s a lot of material in this section and trying all the techniques would require considerable time and effort but I’m looking forward to doing exactly that. Chapter four is all about how using different materials can change your approach. The book is not materials-centric and Liz herself has worked in so many ways that it’s natural for her to talk about using pen and ink, watercolors, markers, pencils, watercolor pencils, colored pencils and in each section on each she provides information that causes me to want to try them too. She does this both to show you how these materials change your approach but also to provide insight into how to use each. This book provides lots of ideas you’ll want to pursue. 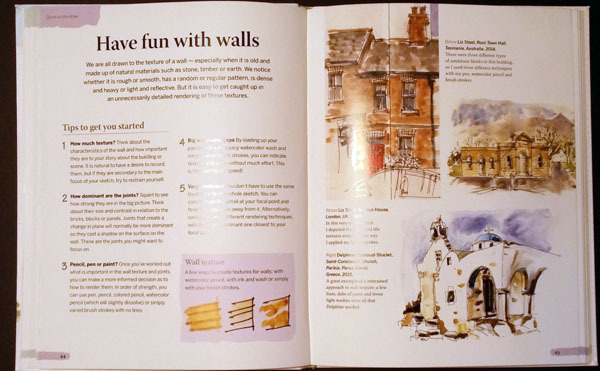 If you need more information than Liz could provide in the book, her Sketching Now web page is the entry point to three courses she provides, titled Foundations, Edges, and Buildings. In my opinion, they should be taken in that order. They are some of the best pedagogy available in online art training and I highly recommend them. In conclusion, if you’re interested in drawing buildings on location, or just want to improve your location sketching in general, this is a book worthy of your time. There are many sketchers who have helped me climb the treacherous learning curve that comes with wanting to learn to draw, but Cathy Johnson, Marc Taro Holmes and Liz Steel have provided the most advice, inspiration and models for who I want to be when I grow up. I’ve been lucky enough to meet and sketch with Marc Taro Holmes but I’ve never met Cathy or Liz but I feel I know them well because of the internet. All three are ever-present when I’m sketching. If you’re a sketcher you know Liz Steel but if you’re an economist following an errant URL from Google, Liz is one of the most prolific purveyors of sketching information on the planet. She blogs incessantly, has several online classes that are among the best, and she has a new book coming out called 5-Minute Sketching: Architecture. It won’t be available until October 1st but you can pre-order it as I just did. You won’t be disappointed. While I’m at it, Liz’s new course, SketchingNow Buildings: Essential Concepts for Sketching Architecture will be starting September 7th. Her courses are packed with information, in video and written form so if you’re struggling with drawing architecture, this 6-week course is for you. 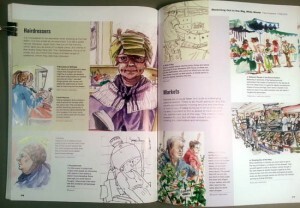 The golden age of sketching is upon us and books about it are flooding onto the market. They come in several forms. Lots of them are about inspiration and motivation. Seems there are a lot of folks who need to be goaded (the high-minded word is ‘inspired’) into having fun (grin). These include, however, a lot of great stuff to dismiss the myths that you have to have special genes to draw and have fun drawing. These books are probably more responsible for the sketching revolution going on than anything else. Then there are those books that illustrate, quite literally, what it is to be an urban sketcher, nature journalist, etc. Typically these are compiled by one artist using their sketches and those from a large number of other sketchers so you get a good sampling of the styles, approaches, and subject matter associated with a particular form of sketching. Finally there are instruction books. These books try to teach you how to sketch or how to do some particular type of sketching. 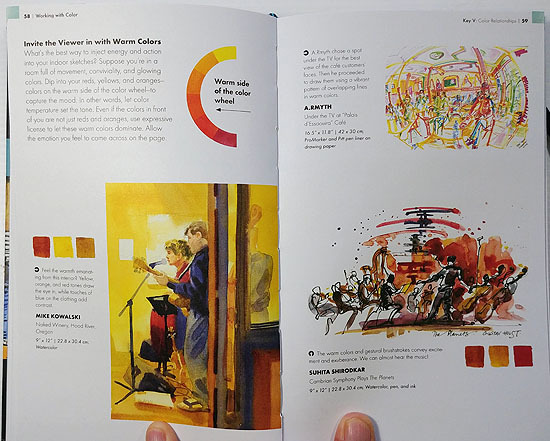 As has always been the case in art book land, the majority of instruction books assume you don’t know anything about art or drawing and so spend a lot of their time telling you about color wheels, which end of the brush is the good end, and stuff like that. Fortunately, we’re starting to see a few instructional books that assume you know something about putting pen/pencil to paper and they concentrate on particular techniques and approaches to sketching. 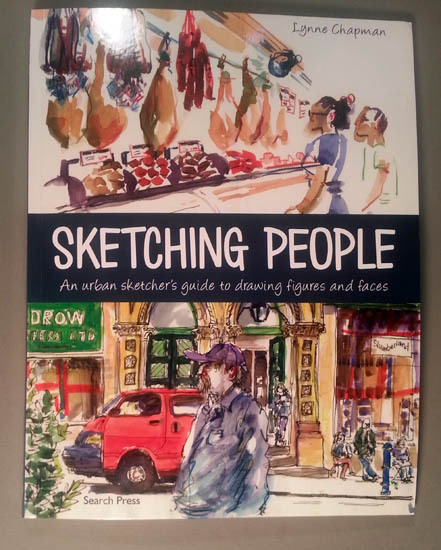 As someone who has been sketching for a while, I welcome these books the most and Lynne Chapman’s Sketching People: An Urban Sketcher’s Guide to Drawing Figures and Faces fits into this category and I can’t recommend it enough to those wanting to improve your ability to sketch people on location. I’d even go further and recommend it to anyone wanting to improve their ability to sketch on location regardless of subject. This is not something most reviews would say much about, though more and more we’re seeing reviewers talk about the number of typos they find in books. The publishing world has been shedding editors like crazy and the impacts have become evident to anyone who is a fan of the written word. So, I want to talk about, and applaud, how Lynne Chapman and her publisher, Search Press have produced a book that is considerably better than the norm in several ways. First, there are no typos, at least none that I saw. There are no captions on the wrong graphics. There are no grammatical errors. One caveat here is that I ordered my book from Book Depository in the UK because Amazon Canada claims that the book is not available yet. So mine is the British version of the book. In any case, this book is spotless as a result of good copy editing and proofing processes. The book layout is simply amazing. This book is packed with information and yet all of it is readily accessible. The number of graphics they’ve managed to pack into the book, when compared to most others is wonderful, but more importantly it allowed Lynne to include a ton of information associated with those graphics in the form of paragraph-size captions. Lastly, the overall book organization is superb. Each chapter, or set of sections leads well into the next and the knowledge gained from one chapter is built upon in subsequent sections. There’s one tiny exception…I had to find at least something to grouse about. 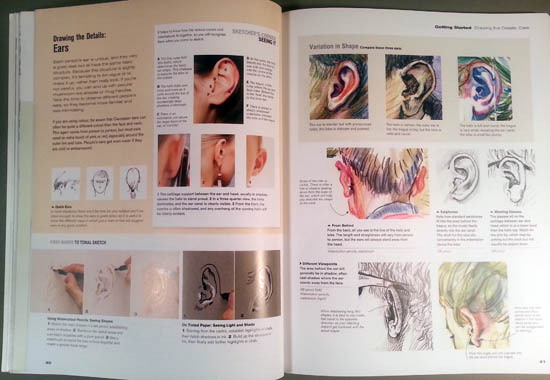 Lynne uses a limited number of colored pencils in many of the example sketches and it’s impossible not to be asking “what colors are those” throughout the book. 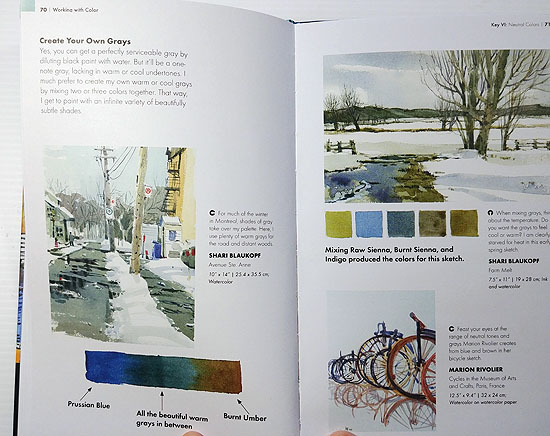 The answer to that question comes near the end of the book, in a section about using a limited palette. I would have liked to have known those colors sooner. This is a tiny thing, however, as the book should be a model for what other publishers should be doing. The first section, Getting Started, introduces the idea of sketching people with discussions of urban sketching, why sketching people is not only fun but possible and Lynne throws in a dash of ‘don’t be afraid…people like it when you sketch.’ This last point is always a hard thing to sell to anyone who hasn’t done it and one of those ‘yep, she’s right’ for anyone who has. The book then launches into a series of short sections on how to draw ears, eyes, noses, hair, clothing, etc. and I love these sections because they’re presented by a sketcher for a sketcher. Most books on drawing body parts come from people who do portraits and while a fully rendered nose is a sight to behold, it’s hard to translate those techniques to a much quicker line drawing done on location. Lynne bridges that gap with these sections, showing different methods of drawing human parts in a short period of time. At this point I should say that I think this book is about two things. 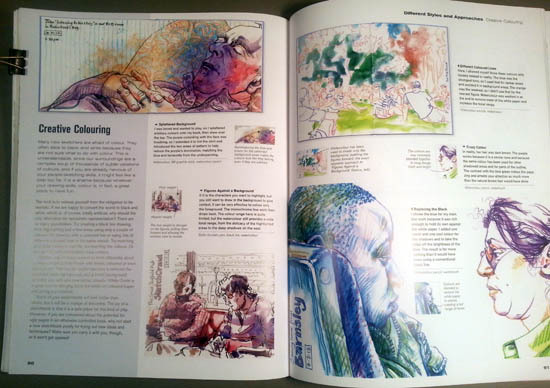 It sort of says so in the title, Sketching People: An Urban Sketcher’s Guide to Drawing Figures and Faces, and while it is about figures and faces, it’s also about drawing quickly and drawing when you have more time. When Lynne is on a train she’s got 15-20 minutes to draw faces. When she’s in a farmer’s market, she’s got no more than a minute or so to capture a human, trying to incorporation the action of the moment. These different circumstances require different approaches, different emphasis on some parts while letting others take a back seat. All that follows the Getting Started section tries to navigate these shifts in approach and Lynne does a great job of providing tools to accomplish it and examples where she has done it. For me this is a fun section. 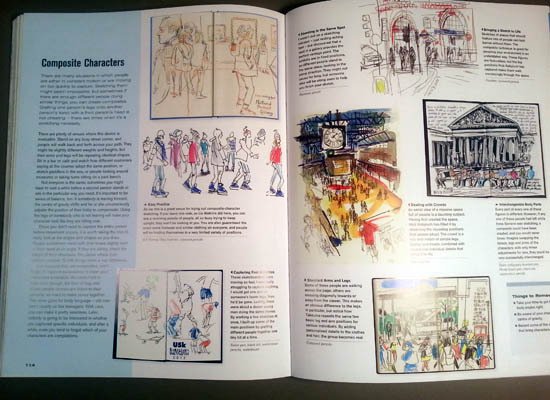 At its core it’s a section that suggests different places where you can sketch people on location and it presents examples of just that. Lynne adds much more. She talks about the challenges of each venue, vantage points, choosing subjects, particular actions and attributes of people in that venue, and how to capture them on paper. I just had to include a photo of the page below as the pretty lady with a bunch of green pads on her head is Lynne herself, a selfie she drew from a mirror as she waited for her highlighting to take. ln this section Lynne puts the heart of the location sketcher, or maybe their brain. 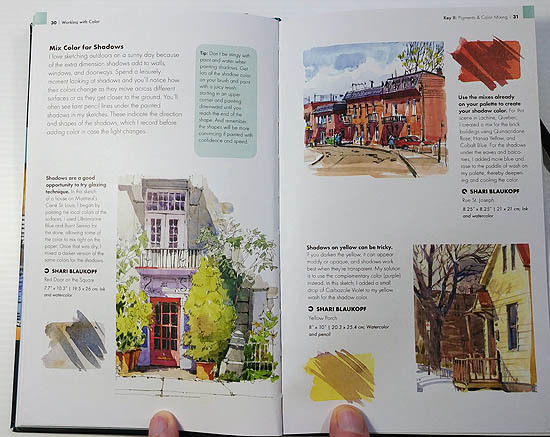 She talks about different styles, like Creative Color, Fluid Lines, and Less is More and other sections on how to quickly plan a sketch, how to paint first, draw later, and even how to place people in their environment. If you haven’t done a lot of street sketching, you’ll find this section valuable whether you draw people or not. The achilles heel of people sketchers – those darn humans move when you’re trying to draw them. But consider the alternative. Better yet, experience it. Ask someone if you can sketch them. If they agree, they’ll stop moving. They’ll also stop being human as they sit up straight, look off into the distance and try to look regal. And then you’ll know – moving people aren’t so bad afterall. 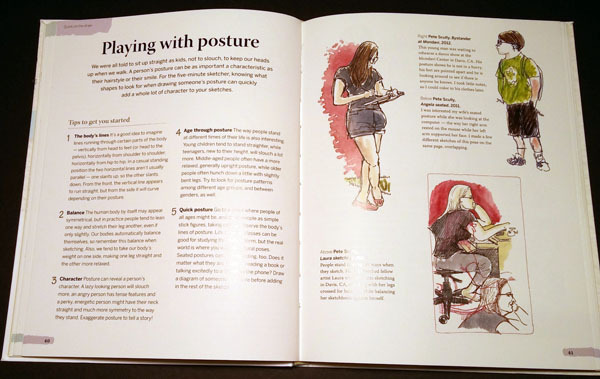 Learning to work quickly is the answer to sketching moving humans and Lynne provides some tricks of the trade to help you do just that. 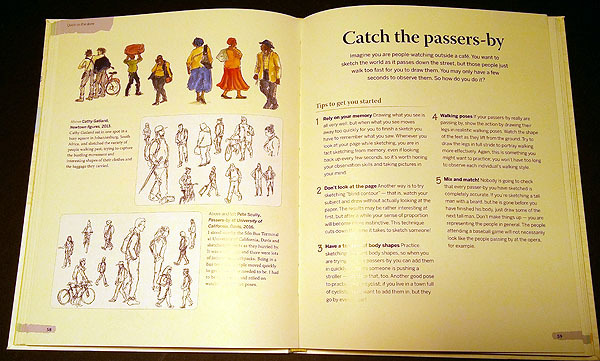 She provides some basics about drawing quickly, talks about capturing poses that repeat and even about how to build composite characters as streams of humans move past you, all doing similar things. 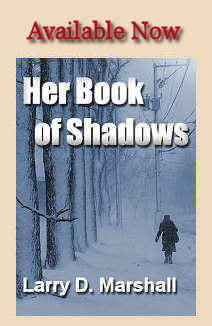 This book is powerful and should be part of every location sketcher’s library. I confess that as a fountain pen guy, I admire Lynne’s multi-color style for sketching people and I ran out yesterday and picked up some Derwent Inktense pencils to give it a try. Maybe I’ll read her book again, copy a few of her sketches, and then hit the streets. I’ve been a fan of Marc Taro Holmes and his art nearly as long as I’ve been trying to learn how to sketch. His style is more loose and painterly than most sketching styles and reflects the fact that he’s a formally trained artist. But as much as I’m a fan of his art, I’ve become more a fan of his teaching abilities. This came first to me in the form of his The Urban Sketcher, which remains my favorite urban sketching book. More recently, Marc’s two Craftsy courses, People in Motion and Travel Sketching in Mixed Media exceeded all my expectations for online courses. Sadly, I find online courses mostly lacking, primarily because they typically assume the student knows nothing and they are filled with yet another description of red/yellow/blue color wheel discussions, what a contour drawing is, and how to hold your pencil in the air to measure things… that I’ve seen over, and over, and over. Not so when Marc steps onto my computer stage. He explains his materials and then launches into discussions of drawing and painting that assumes you know that the pointy end goes on the paper. He does so with clarity that must be experienced. He assumes you want to draw stuff. He assumes you want to paint stuff. And he provides multi-step processes to do both. There are plenty of other places to learn about the color wheel; you’ll not find such discussions in Marc’s workshops. Maybe most important is that he not only describes the process but he explains why he does what he does and what he’s thinking as he does it. He makes it crystal clear what you’re supposed to be learning and why it’s important. Each time I listen to one of Marc’s workshops I learn something more. My understanding is that if you are a paid subscriber to ArtistsNetwork.tv you have access to all four of these workshops as part of your subscription. They are also available directly from North Light as DVDs or you can buy them as downloads. I bought two of them via downloads as I’m an instant gratification kind of guy and besides, there’re cheaper that way. I expected that the concepts Marc teaches in his book and via the Craftsy courses would be the same in these workshops and I was correct. Any thought that this suggests that they are repetitious, however, would be wrong. One fundamental difference is that these workshops are done on location, so Marc discusses his urban sketching tactics as well as discussing his 3-step drawing and 3-step painting processes. Also, because you’re spending so much time with him there are numerous little tips presented as he draws and paints. 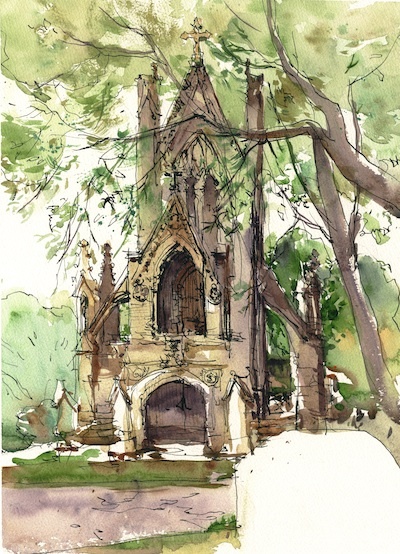 The Drawing and Painting in a Travel Journal workshop takes place in a Cincinnati cemetery/botanical garden and he begins with the major work of the workshop, an old gothic cathedral/mousoleum. Marc walks us through his three-step drawing process, discussing his motivations and thoughts along the way. The videography is outstanding with just the right amount of close ups of the drawing while allowing us to see the subject as well. I particularly liked the painting portion of this as while I’ve seen his tea/milk/honey approach described, here I got to see his actual mixes, what brushes he uses, and how he worked around the painting. I have a bunch of new things to try and practice. Once done with this painting, Marc begins to walk the grounds, stopping to do some quicker sketches in an attempt to capture the essence of the place. At each stop he discusses location sketching, what’s important, and what may be less so. He sketches statues, monuments, and even the busts of a couple of Cincinnati’s founders. While his fluency with a pen is humbling, it’s also inspiring. This workshop runs 100 minutes and in spite of its nearly two-hour length, it seemed to be over too soon. It’s a workshop that, like his Craftsy videos, I’ll watch several times. 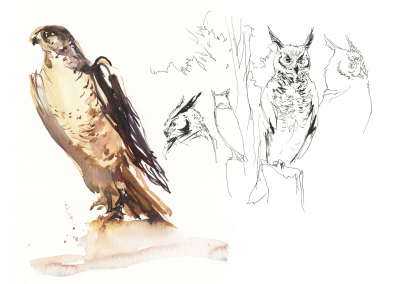 I’m one who believes that ‘urban sketching’ isn’t limited to drawing buildings, cars and people, and Marc seems to agree as his Urban Sketching: Bird Drawing takes place at a raptor rehabilitation center. Marc describes his process of drawing and painting birds using similar techniques to his building and people sketches but here he emphasizes the unique nature of drawing animals, creating textures, capturing moving objects, etc. Here I feel I got a lot out of Marc’s early pencil organization stages as he indicates not only the shape of the animal but also some of the major shadow shapes. He draws several poses simultaneously as the bird is in near constant motion and he shows you how to work back and forth between them, ultimately generating a group of poses. Marc makes this look easy but I find it difficult to shift my brain/eye between poses as the subject moves between them. But Marc’s workshop should help when I try it again. If you haven’t had the opportunity to learn from Marc Taro Holmes, do yourself a favor and pay the little bit of money required to gain access to these online workshops. I’ll leave you with that thought as I’ve got to go buy the other two workshops. 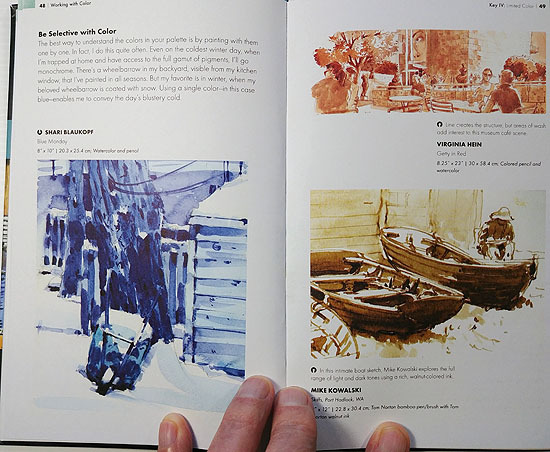 Before I talk about Pete Scully’s new book, Creative Sketching Workshop: Inspiration, Tips, and Exercises for Sketching on the Move, I’ve got to confess that I am biased. If Pete released an illustrated phone book, I’d buy it. 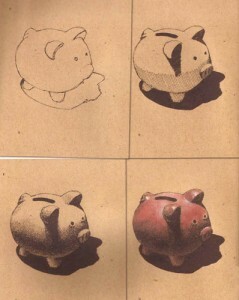 When I got started sketching, his sketches were some of the first that caught my eye. I love his precision. I love his choice of subjects (he got me sketching fire hydrants). I love that he’s a generalist sketcher who is at home sketching Lego characters as he is when sketching urban scenes. Though a clear violation of Pete’s copyright, I’m opening this review with his sketch of his new book; I hope he doesn’t mind. The one on the left is the US version; the one on the right is the UK version. I bought the UK version because it was available when I ordered; the US version hadn’t been released yet. 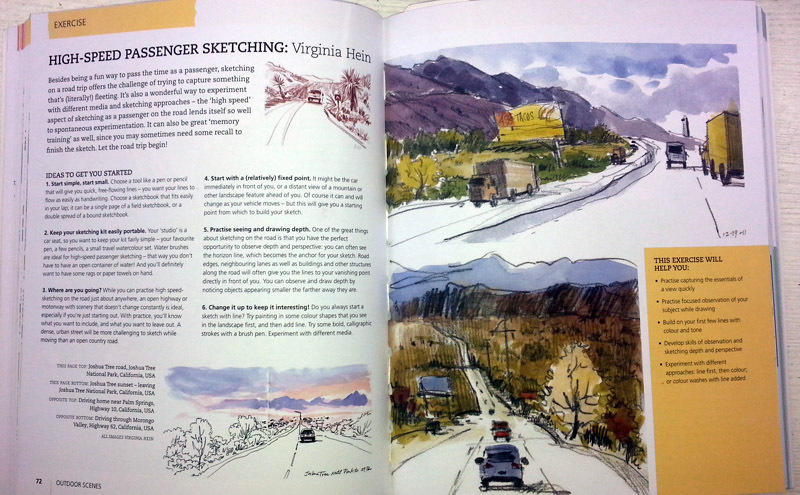 My love of Pete’s work aside, do we really need another sketching book? I find that a funny question to pose because when I got into sketching, only four years ago, there was almost nothing available on location sketching, urban sketching, or even a general acknowledgement that people sketched for any purpose other than as note-taking for paintings. But, we’re experiencing a veritable explosion of interest in sketching, particularly location sketching and it’s absolutely wonderful. Recent releases seem to fit into three loose categories. Rah-rah motivation books: so you want to sketch but don’t think you can, and/or if you can’t figure out what to draw, let us give you a list. The extreme of this are the books that have a bunch of blank pages except for a ‘draw x’ written in one corner. Books on sketching techniques. 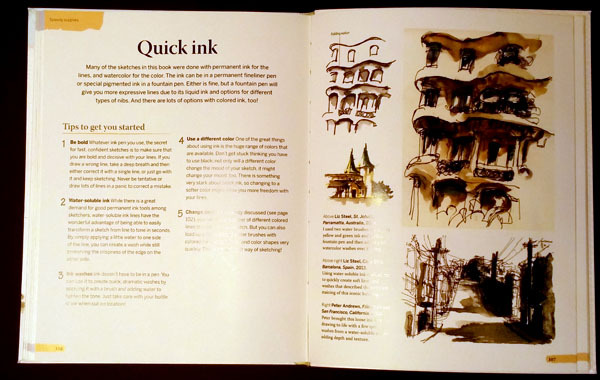 These can be about pen and ink, pencil, paint, and these days may place most emphasis on “urban sketching” as that’s the buzz phrase of our time. Then there are books that are mostly picture books, and more than anything are just a compilation of sketches from a particular artist. All of these have value to someone. Most are directed at the flood of new sketchers among us. As a book nut, I’ve bought most of them and I gotta say that there’s a lot of redundancy within the ranks but I’ve gotten something from each and every one of them. To be honest, I didn’t expect much from Pete’s book in spite of it coming from Pete. I was wrong. Pete’s book has some of all of the above types of content, but it’s the approach that makes it unique and much more instructional content than I expected. The book reflects his generalist inclination when it comes to sketching. He brought together a dozen artists besides himself and together they have produced a series of “workshops” on topics that run the gamut from doing portraits on location to drawing abandoned locations. 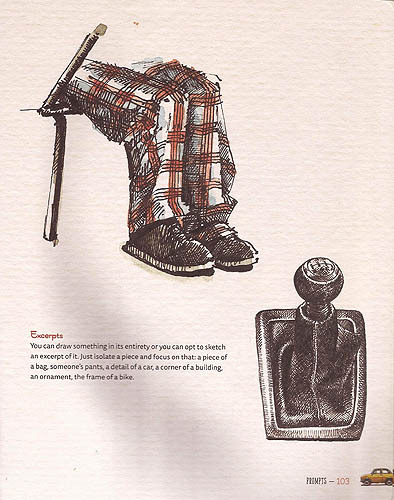 Pete’s fond of documenting his son’s growth and he uses this to demonstrate the virtues of drawing series of sketches, showing us sketches of his son’s shoes, from when he was a baby to his current running shoes. I still favor his fire hydrant series myself but wish I had a similar series of my daughter’s shoes. Each sketching subject workshop is initiated with half a dozen “Ideas to get you started” that serve as an outline for the rest of the workshop but also as a platform for the artist to provide practical advice for sketching their particular subject. Some of this advice is priceless. All of it is good. 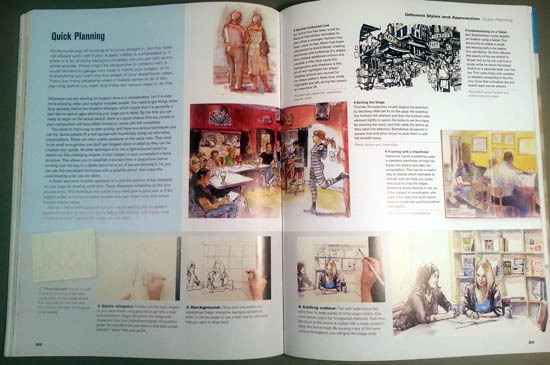 The rest of each chapter consists of several pages of graphic examples and associated text that directs the reader towards the specifics of the sketch, why the artist has done what’s been done, and sometimes with extra advice on the vagaries of doing such sketches on location. In short, this is a book you’ve got to read and study. But yeah, you’ll want to flip through it, just looking at the pictures like I did when I got it. The eye-candy is sweet. But this review comes several days after receiving the book because I wanted to read all of it before writing. 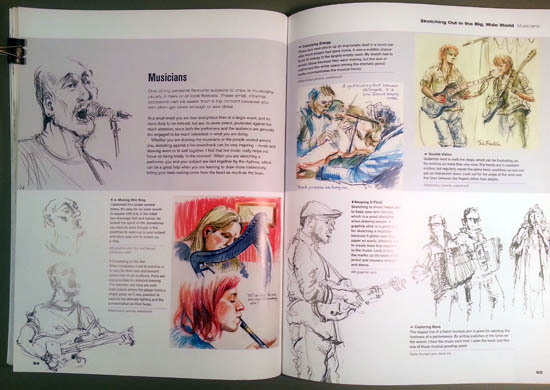 Because of the artists assembled here, this book provides considerable variation in sketching styles and approaches. Thus, even without the words, there’s a lot to study here and this book will sit by my bed for a while as I love staring at sketches, trying to understand what the artist was thinking and how they solved this or that problem. I very much recommend Creative Sketching Workshop to anyone who sketches on location or wants to learn the approaches of people who do. I got into sketching at the right time as we’re clearly living in a golden age for those of us who like wandering around sketching our towns. The popularity of journal sketching has exploded as more and more people realize that the classic ‘you aren’t talented enough for art’ stuff is a myth and the number of artists willing to help those of us trying to learn is extraordinary. How did people learn anything before the internet? What’s lagged behind is the art world. Frankly, most still don’t get it. They still believe that a sketch is something you do in preparation for a formal painting. While architects, illustrators and animation types fill sketchbook after sketchbook, fine artists don’t even own one. Even that is changing. With any luck at all, the local art supply stores will catch on as well but for now, I find that for most of my gear I have to go online. The choices of materials, however, are growing daily. With all these things going on, it’s hard to imagine better evidence for a sketcher revolution but there is one. 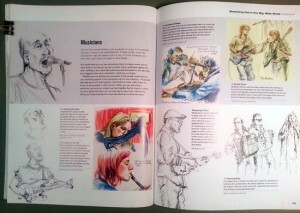 It comes in the form of a steady stream of books on sketching that are hitting the market like fresh corn in September. 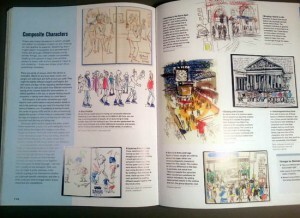 When I started sketching, the single “urban sketcher” book was Gabi Campanario’s Art of Urban Sketching. But in the past couple years I’ve bought at least a dozen books on quick-sketching and urban sketching and there are more on the way. 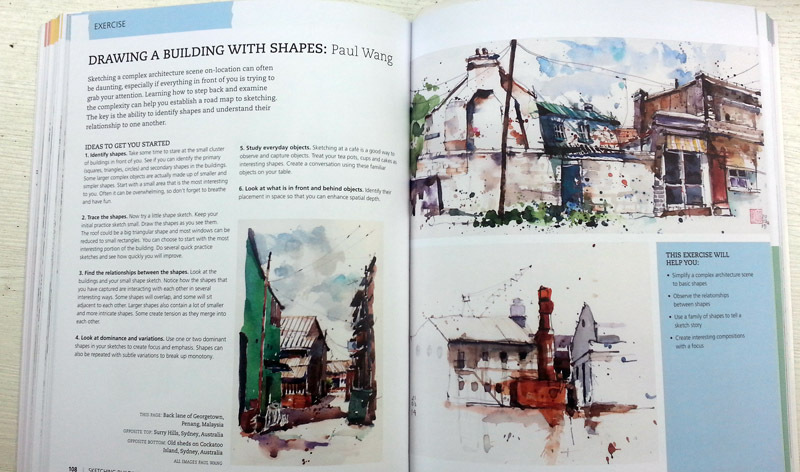 And so, when France Belleville-Van Stone’s book Sketch was released I very nearly passed on it, assuming it was another ‘here’s how to sketch’ book. I’ve followed her blog for a long time and enjoy her sketches a lot, and so in a moment of weakness I pressed the button on Amazon. The book’s arrival made it clear that I would have made a big mistake by not buying her book. The reason is hidden, not so subtly, in the subheading of the book – Sketch: The Non-artist’s Guide to Inspiration, Technique, and Drawing Daily Life. 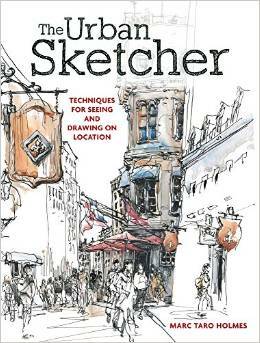 This book is about how to think like a sketcher and she provides inspiration and ideas for how to approach sketching that are often sidestepped by those more concerned with telling you what paper and pen to use. Couple this with the high quality of the writing and you can’t help but enjoy it. 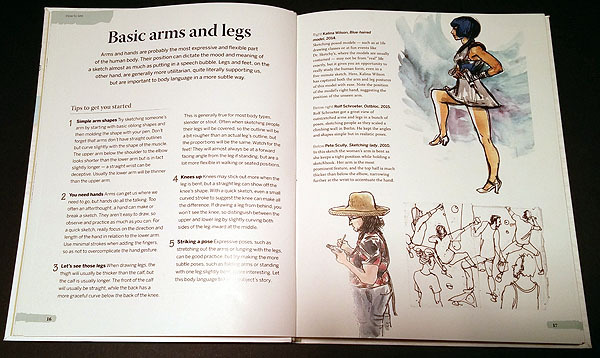 While France’s sketches are fantastic, this is one art book where the words are an important part of the package. France begins by addressing the nonsensical use of the word ‘talent’ by those who suggest they don’t have any. I won’t try to recap this section except to say that both prose and insights are fantastic and put a smile on my face. This introduction leads to chapters on materials and techniques and I love both for what is not there. There’s no attempt to cover all the possibilities and, in fact, France says she isn’t doing that and that she’s talking only about the materials she uses. 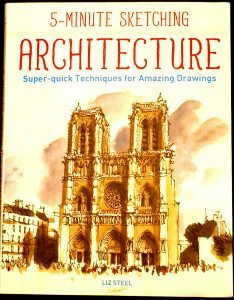 Similarly, while France is a seasoned artist, she opens here techniques section with “There is a bit of irony in me attempting to write a chapter on techniques, knowing my last drawing lesson dates back to elementary school….” In truth, France provides plenty of techniques in this book but not in the traditional form. 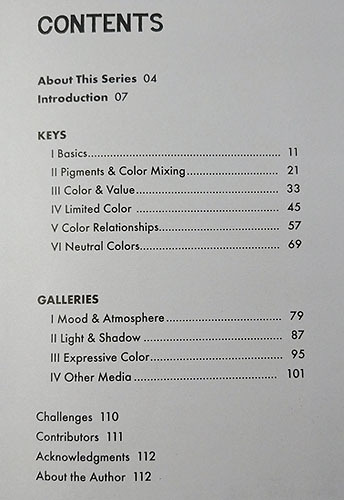 There are no sections on perspective, color theory, or the rest of the stuff you can find in any intro book on drawing. The single exception is that she does spend some time on approaches to hatching and since that’s such an important facet of her own sketching style, this makes perfect sense. What France gains by not filling the book with stuff you can find in any drawing book is a lot of space to talk about strategies and tactics of a sketcher. How do you deal with drawing environments that restrict the time you have to draw? How do you redefine “complete” when it comes to your sketches? How might different definitions affect your approach to different subjects? She talks about completely relinquishing the need to complete anything at all? Here she discusses one of my favorite dichotomies – being motivated by the process of art rather than products of it. She eloquently discusses how liberating it is to shift away from emphasis on the products, placing all of it, instead, on the fun that comes while you’re doing art. Ever drawn something and left it on a table at a restaurant? I have and as France describes such a though is very liberating. But I was wrong…or right…no wrong. It is a list that walks you through the alphabet, providing subject matter for each letter so in that sense I was right. In the case of A, for instance, France uses Animals and Airports and talks about the value of sketching animals and the rich environment that is an airport. But for other letters (eg -E) she’ll talk about the potency of doing Excerpts, discussing how sketching pieces of things is fun. In each case she provides great examples from her own work and I thoroughly enjoyed this section, and now more ideas and more varied perspectives on how to choose my subjects. 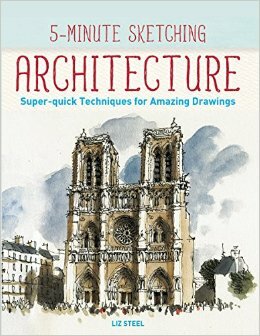 In the end, this is a wonderful book for anyone interested in sketching what’s in front of them and/or simply likes France’s art as much as I do. 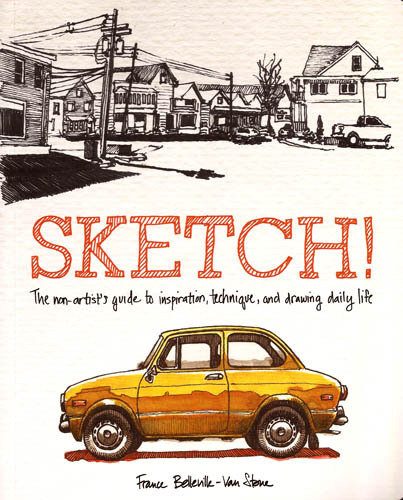 Sketch: The non-artist’s guide to inspiration, technique, and drawing daily life is brilliantly written, making it more fun to read than many art books.